The release date of the OMEN album Hammer Damage on limited vinyl is June 24th, 2016. The pre-order phase will start on June 10th, 2016 in Pure Steel Records webshop. "With the signing of US Metal legend OMEN, an old dream of ours has come true. For us, at Pure Steel Records, classic albums like Battle Cry and Warning of Danger are historical contributions to the metal world. 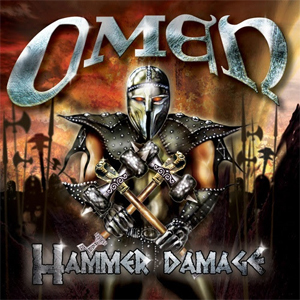 With a striking release entitled Hammer Damage, the first studio album since Eternal Black Dawn (2003), OMEN is back in the saddle and means serious business. The new album was mixed by Kenny Powell and mastered by QuSound Studio/Michael Kusch. When listening to epic and catchy power hymns such as “Hammer Damage” (the incisive title track) or the hard pounding “Cry Havoc” or the masculine pathos “Hellas”, fans of the Californian quartet will completely go crazy. Already active in OMEN between 1998 and 2009, Kevin Goocher (also PHANTOM X), with his raspy voice, will often remind you of the late J.D. Kimball, while guitarist Kenny Powell, also part of the 2016 lineup, has obviously not lost any of the striking guitar skills he displayed during OMEN’s glorious early days. With Hammer Damage, OMEN clearly show that they are ready to reclaim their throne as masters of unadulterated US Metal. After the CD release in May 2016 follows the album Hammer Damage in a limited edition of 100 blue and 400 black copies with insert."